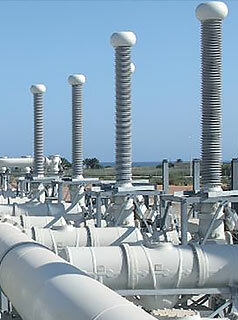 GE provides cost effective solutions to facilitate the electric stress control of your equipment. Our bushings for electrical transmission offer AC and DC solutions with high-value customer benefits: longer lifetime and higher reliability, increased safety, no maintenance and installation flexibility. For more than 90 years, GE’s bushings have been synonymous with excellence, quality and competence in the high voltage field. GE has three dedicated factories in Italy, India and China, with Italy being the center of competence and development. Motivated to provide you with innovative and superior quality products, our vision remains focused on meeting customer requirements while anticipating and exceeding the needs of a continuously changing market. Grading capacitor is encased by special fiberglass cones that ensure a triple barrier system between the transformer oil and the valve room and so no oil from the transformer can flow into the valve hall. Direct gas leakages to the transformer are not possible thanks to pressure sensors installed on the OIP section. The oil of the grading capacitor ensures excellent thermal performances especially for high current ratings (>=4500 A) and harmonics due to the convertor operation. No risk of pollution of the grading capacitor due to the non-exposition of the paper roll during the bushing installation on the transformer. GE’s hybrid HVDC converter bushing is based on two technologies: oil impregnated paper (OIP) for the grading capacitor that interfaces with the transformer and SF6 gas with a special composite insulator for the air side. This hybrid technology complies with the strong request of the DC market to have dry type bushings and avoid the risk of oil spill inside the valve room. It is secured, reliable and safe and efficient. The main aims of this test were to demonstrate the RIP bushing’s explosion proof capabilities, and to check its safety in the case of very dangerous events following an internal severe electrical fault. To demonstrate this, a 420 kV normal production bushing was subject to an internal arc test with a short circuit current of 63 kA applied for 0.5 s. Safety is demonstrated if no parts are projected outside a circular safety area of 3 m radius around the bushing, and if no explosive events occur in the air side, i.e. the top part, of the bushing. This video shows the effect of the simulated fault. The value of the measured injected energy during this test is impressive. The energy amounted to 13 MJ, which is equivalent to a 1000kg mass launched at a speed of 580 km/h or 360 mph! This test, typical for other components such as instrument transformers, is a first for transformer bushings. In 2011 Alstom Grid was the first in the world to perform such an internal arc test on a 420 kV bushing based on the traditional oil-impregnated-paper technology and now it has repeated this success on the new 420 kV bushing, based on RIP technology. Grid R&D teams have successfully tested our 820 KV/4500 A Bushings for HVDC converters, placing us as one of only three players to manufacture this technology. The bushings were designed in Milano, Italy and have now been fully type-tested and successfully completed their temperature rise tests over the rated current limit to confirm their suitability to meet all requirements.